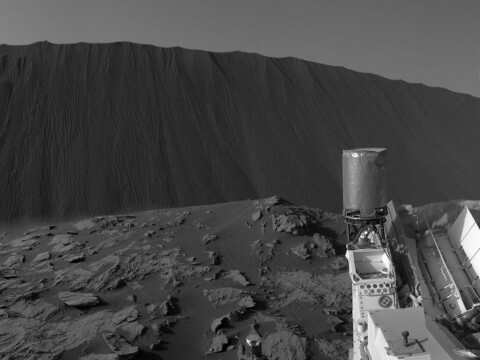 Pasadena, CA – As it drives uphill from a band of rippled sand dunes, NASA’s Curiosity Mars rover is toting a fistful of dark sand for onboard analysis that will complete the rover’s investigation of those dunes. Pasadena, CA – Some of the wind-sculpted sand ripples on Mars are a type not seen on Earth, and their relationship to the thin Martian atmosphere today provides new clues about the atmosphere’s history. 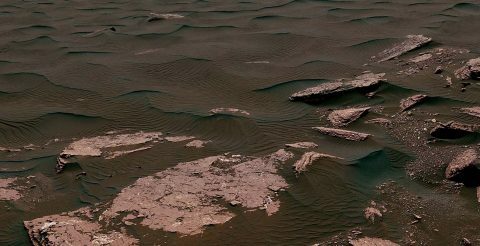 Two sizes of ripples are evident in this December 13th, 2015, view of a top of a Martian sand dune, from NASA’s Curiosity Mars rover. Sand dunes and the smaller type of ripples also exist on Earth. 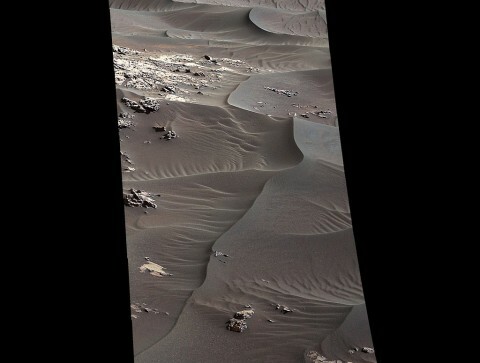 Pasadena, CA – NASA’s Curiosity Mars rover, partway through the first up-close study ever conducted of extraterrestrial sand dunes, is providing dramatic views of a dune’s steep face, where cascading sand has sculpted very different textures than the wavy ripples visible on the dune’s windward slope. 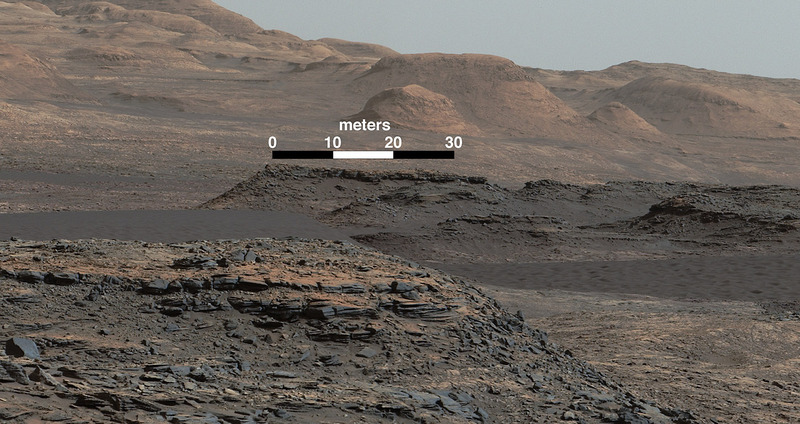 Researchers are using Curiosity to examine examples of the Bagnold Dunes, a band of dark sand dunes lining the northwestern flank of Mount Sharp, the layered mountain the rover is climbing. 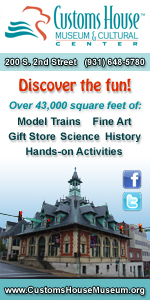 Pasadena, CA – NASA’s Curiosity Mars rover has begun an up-close investigation of dark sand dunes up to two stories tall. 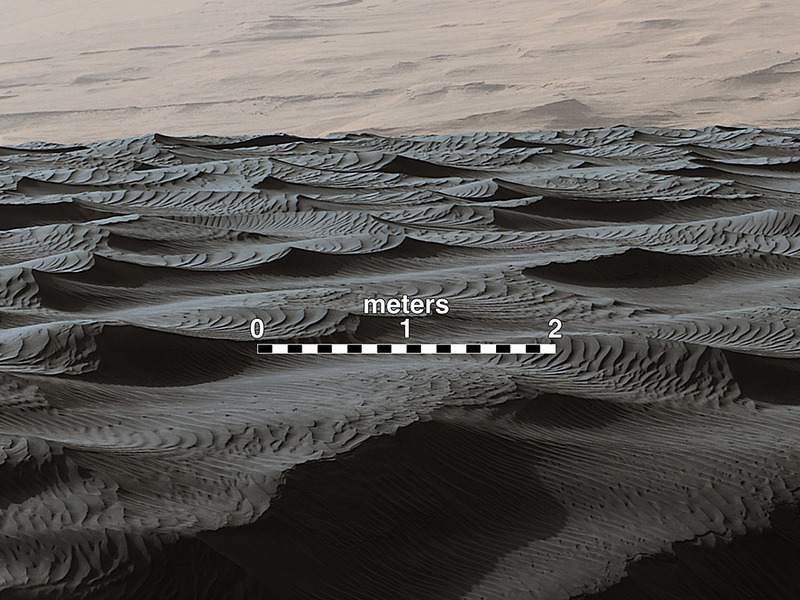 The dunes are on the rover’s trek up the lower portion of a layered Martian mountain. 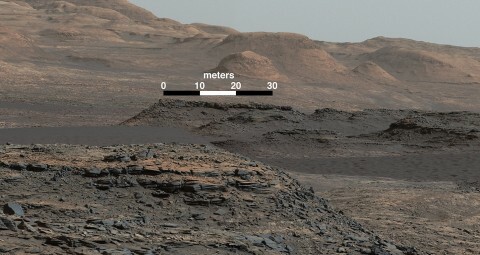 The dunes close to Curiosity’s current location are part of “Bagnold Dunes,” a band along the northwestern flank of Mount Sharp inside Gale Crater. Observations of this dune field from orbit show that edges of individual dunes move as much as 3 feet (1 meter) per Earth year. 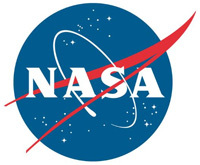 Pasadena, CA – On its way to higher layers of the mountain where it is investigating how Mars’ environment changed billions of years ago, NASA’s Curiosity Mars rover will take advantage of a chance to study some modern Martian activity at mobile sand dunes. In the next few days, the rover will get its first close-up look at these dark dunes, called the “Bagnold Dunes,” which skirt the northwestern flank of Mount Sharp. No Mars rover has previously visited a sand dune, as opposed to smaller sand ripples or drifts.